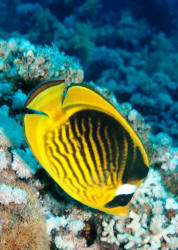 A Chaetodon... fasciatus! Not lunula... in the Red Sea. Unidentified Butterflyfish II - 09/12/08 Ben again, <Hello there.> thanks for your help, the link you gave me showed a juvenile Hong Kong Butterflyfish that is 3.5cm in length and the black dot on the caudal peduncle is nearly gone, my specimen is 6cm in length with a full black dot and it has a yellow crest around the front of the black dot. 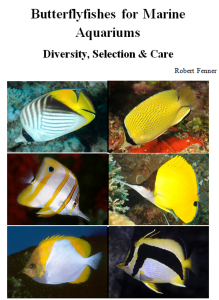 <The sizes when Butterflyfishes change from juvenile to adult coloration are not carved in stone.> It also had an orange tinge to the dorsal spines, all along the top. I'm not doubting you, <You may, since here we don't have a 100% coincidence with literature, only an obvious similarity. You can ask at the Australian Museum, fish department www.amonline.net.au/fishes/ e.g. Jeff Leis (he has a research project on fishes and in NSW) for a second opinion. > I just want to be sure as to what it is and if you still stand by your suggestion. <So far I do.> Here is another pic. <Thanks! Beautiful specimen.> Oh and yes I'm in Forster, NSW.